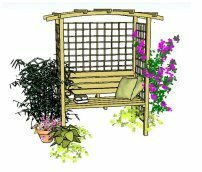 If you would like to build this corner pergola in your garden these corner pergola plans will help you to achieve your dream! A corner pergola is a very beautiful feature in it's own right, adding height, interest and, with the use of wonderful climbing plants, colour and fragrance to a garden. It gives a feeling of being cosy and welcoming, drawing everyone under it's spell! Fitting very snugly into the space, a corner pergola will give a panoramic view of the garden, whilst also giving a sense of enclosure. This makes it ideal for relaxing, entertaining, a place to catch the sun or a shady retreat, depending on how you wish to use it! It provides shelter and protection as well as a focal point for garden. Attached trellis panels are an ideal support for the most wonderful climbing plants. It is rather an unusual pergola with the fabulous radiating rafters being the most eye-catching feature. They splay out to focus on other garden features such as planted borders, water features, sculptures and other hard landscaping structures, and yet draw the eye to the apex of the pergola itself, encouraging you to sit underneath. This two way focus is particular to the corner pergola, and is what makes it such a wonderful garden structure. You will be so proud of your new creation. And think of all the things you could use it for! Eating 'al freso' with friends or family. For some pergola romance with the one you love...! 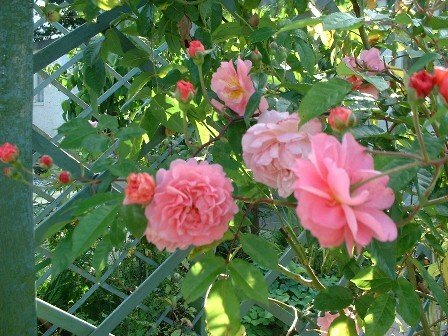 Relaxing on a warm sunny day in its fragrant shade. Taking a well-earned rest between tending the garden. Some star gazing, with attached lighting and fragrance burners. Heaped with lots of cushions and throws for lazy days. De-stressing with a bit of yoga or meditation. Showing off your brilliant display of climbing plants. Growing grape vines and sampling the produce! All manner of furniture and accessories can be used to enhance the area, bringing it to life; such as cushions, loungers, benches, hanging chairs, throws, table and chair sets, lights, fragrance burners, statues, sculptures, shade sails – what ever you wish. Be creative! Is it possible to build this pergola yourself? The simple answer to that is yes! 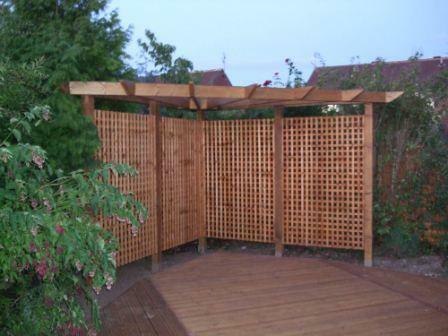 We previously built a corner pergola using your plans and it worked beautifully. We have moved house since then and we are now wanting a plan for a pergola with a contemporary look, size 3.5 metres square. The fact that it looks so fabulous makes it look, perhaps, more difficult than it actually is. Of course, you can use the principles outlined in the free pergola plans to build any pergola. But if you would prefer to have a step-by-step guide to building this particular corner pergola, for the price of one of the rafters, you will have, at hand, detailed instructions on how to achieve an absolutely beautiful structure for your garden – one that is achievable even for a beginner. The corner pergola plans cover everything that you need to know to get everything just right: what tools and materials you will need and how to source them: simple, yet detailed diagrams with precise instructions on how to make sure everything is level, where to place the radiating rafters that form the roof, how to mark and cut the notches, and much more. The added bonus is that it is much cheaper to build your own pergola than to have someone build it for you, and it is so satisfying when it is all finished and you stand back to admire your own creation. And then you have the fun of adding plants and accessories. The building cost for this project is around £260, taking into account the price of the posts, post anchors, trellis, rafters, screws, bolts and washers. To have it built would probably cost about £500 -£600, if not considerably more, depending on the contractor's rates. So, you would, indeed, be making a considerable saving! Adapting the corner pergola plans, to give a truly unique structure, is also easy, and detailed instructions are given on how you might do this. This particular pergola was built as a bespoke structure for a client. The corner wasn't a true corner and had to be adapted to fit into the space. It shows how adjustments can be made for unusual situations. However, the corner pergola plans are written to fit into an exact corner. This one had trellis only on two sides. You can have trellis wherever you wish - or simply have none at all, letting the beautiful climbing plants climb up the posts. Included are 18 free rafter tail design templates that you can print out and use straight away. Shaped rafter tail ends give the most noticeable difference to your pergola, lending it an individuality that will make it stand out from the rest. 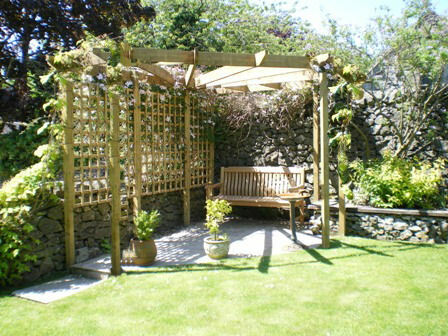 By eliminating the short sides, we were able to create a three-sided, rather than a five-sided corner pergola. 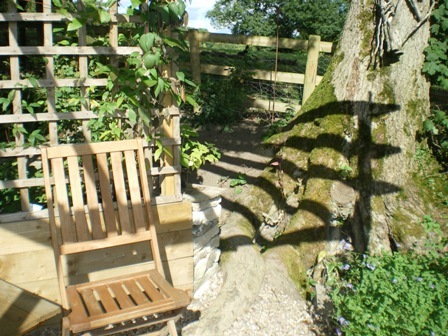 This is another corner pergola that has been adapted to fit around the magnificent stump of a tree. All three pergolas have been adapted from the standard plans. If you need help to to do this, please use the contact form and we'll try to work it out. Many a corner pergola has been created this way! So why will these corner pergola plans be great for you? There are photographs to illustate particular points. 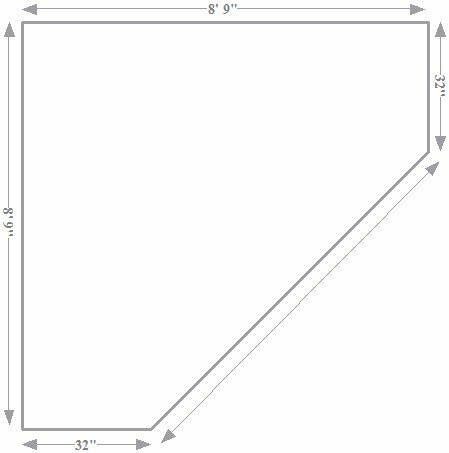 Have the corner pergola plans immediately downloaded, ready to use. 1 The step-by-step plans, which will guide you through every stage of building this wonderful pergola. 2 A FREE bonus of 18 different rafter tail templates, to fit the size of these particular rafters, ready for you to print out and use. If you would like to contact me for further information about the corner pergola plans, please use the contact form. 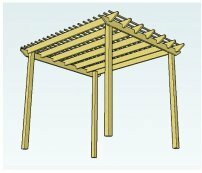 Or take a look at the Corner Pergola Plans - FAQs for more help with the plans and download process. 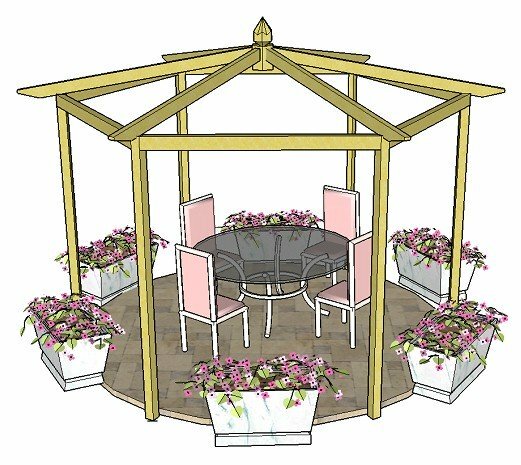 I always love to hear from anyone who has made a pergola from one of the plans, so if you feel like sharing your achievement, just fill in the feedback form and let us all know how you got on! "I have just finished building my pergola and it looks amazing. The plans were so detailed they were easy to follow. Thank you so much for giving me the confidence to do this myself. I can't wait to get plants growing up the trellis now!" Here’s to you and your wonderful corner pergola.